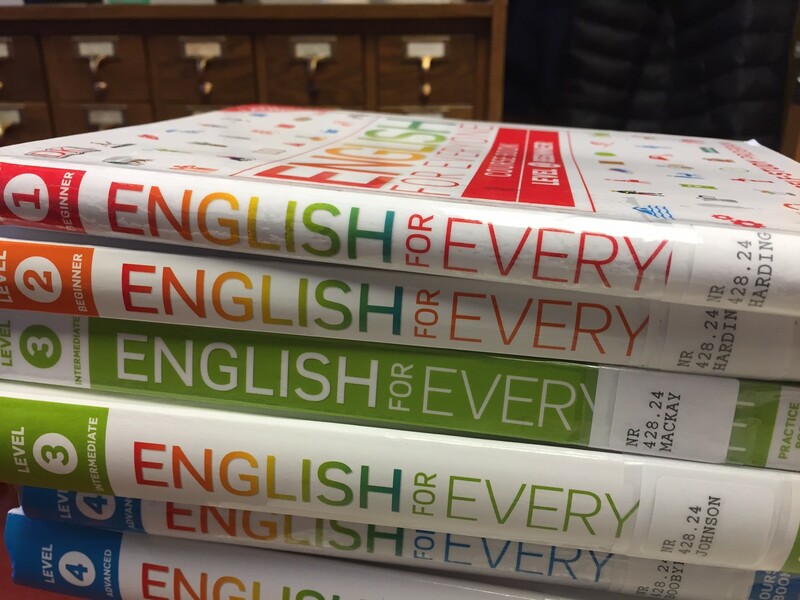 We’ve added a lot of new materials to our Adult Literacy and English Language Learning shelves. I thought I would regularly highlight some of these new materials and this week we are looking at English for Everyone. This program has multiple components and focuses on the self-learner. The first component is the print material, which includes a course book and a practice book. The course books are designed to facilitate English language learning and understanding. The practice books have additional exercises to reinforce new skills. Each unit is broken down into modules, which should be done in order. The course is split into four levels aimed at learners at different stages. Level 1 Beginner is aimed at learners with little or no experience of English. Level 2 Beginner is for people who know the basics, but not much more. Level 3 Intermediate is for confident speakers wanting to sound more natural in a wider range of situations. And level 4 Advanced is for learners with strong English skills who want to learn colloquial English. On the back of each book you can find more information about the four levels and how they relate to the CEFR and global exam standards. To fully take advantage of this program, learners will need to register for an account online. This allows anyone to leave the site and log back in later without losing their progress. We have found this feature really useful to learners using the Mango Language Program. Most modules in the books have supporting audio recordings of native English speakers to help learners improve speaking and listening skills. Every module in the book is identified with a unique number to easily locate the correct audio component. Each file can be played, paused, and repeated as often as needed. Audio can be accessed online through the website, but also through the free iOS/Android app. This allows users to learn on the go. Another component is the ability to access exercises online for free (unfortunately there are limits on the number of free exercises available). The online exercises are interactive versions of the English for Everyone practice books. We hope this highly visual course allows for a deeper understanding of the English language. The extensive supporting audio and exercises, both in print and online, allows for greater access for language learners.